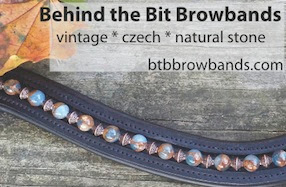 Behind the Bit: Warmblood inspections: horsefest! Like many horse owners, I always seem to be cash-strapped. Vacation? Not this summer. What I did this summer is my own little inspection tour: Two Hanoverian, one Oldenburg, at two different farms. Sport horse enthusiasts will be hard pressed to find a more entertaining and educational pastime than a horse inspection. We're talking baby horses. Lots of'em. Running around. There are also mare inspections and sometimes stallion inspections. Inspections have educational value -- imagine if someone invited you to a clinic on evaluating young prospects held by some of the most experienced and respected breeders/horsemen in the industry. Imagine they told you it was free. You'd go, right? The value and contribution of the mare in breeding -- you see it first hand! I meet the people who are breeding the riding horses of the future. What happens at an inspection? Inspection tours are sponsored by a warmblood registry such as GOV Oldenburg, KWPN, RPSI, or Hanoverian registries. A select group of inspectors (usually 2 or 3) tour a region, visiting designated inspection sites. Breeders from the surrounding area bring their mares, foals, and sometimes stallions to be inspected. Each registry follows different rules for inspecting and rating the animals; each uses its own rules and terminology. 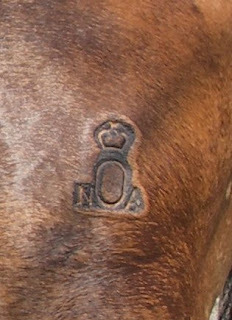 For example, the Dutch warmblood registry inspection is called a "keuring." The Oldenburg registry assigns a premium rating to its nicest foals, while the Hanoverian registry does not do a formal rating of its young stock. Mare inspections Disclaimer: I've only seen Oldenburg and Hanoverian inspections, so these observations are based on those registries. Mares are formally and publicly evaluated for the purpose of being added to a registry's list of approved mares. If a mare is in a registry's mare book, any baby the mare has is eligible for that registry if the father is an approved stallion for that registry as well. All mares in the registry's mare book go through the registry's inspection process, even mares that belong to that registry. For example, a registered Hanoverian mare will still need to be approved before she is included in the Hanoverian main mare book; an Oldenburg mare may be inspected/approved for the Hanoverian mare book, as well as a thoroughbred mare. They just have to meet the standards set by the registry. I guess an owner could have her mare inspected/approved for more than one registry (stallions can), but for the most part mares seem to be approved for just one registry. I believe it costs over $500 to get a mare inspected. Mares are judged on conformation and movement. Each mare receives a score (scale 1-10) for such attributes as head, neck, foreleg, saddle position, hind leg, femininity of type, and general impression. Movement (correctness, elasticity, impulsion, etc.) is also evaluated on a 1-10 scale, usually by watching the horses at liberty. Sometimes they are judged walking and trotting hand. Mares must achieve a certain composite score (usually above 6) to be included in the registry's "main mare book." Mares who achieve a certain score may be as candidates for a special status indicating exceptionally high quality. In the Hanoverian Society, mares who achieve a composite score of 7 or higher are eligible for the status of "elite mare" or EM. In Germany, I think the status is called "States Premium" (SPS). If a mare's name has EM or SPS next to it, they have met all requirements to be included in the registry's "A-list" of highest quality mares. Mare performance test To qualify for the elite or special status, mares must complete a mare performance test (MPT) -- at least that is what the Hanoverian Society calls it. 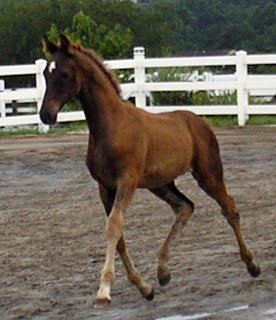 At a Hanoverian MPT, mares are evaluated for conformation and movement. They also free jump and they are ridden for the inspectors, usually in pairs. During the ride they are asked to follow inspector's directions to walk, trot, canter, circle, lengthen, etc. Their rideability and other criteria are evaluated on a scale of 1-10. Stallions I have only seen an Oldenburg inspection that included stallion inspections, but from what I've read and seen all registries use a similar process. As in the mare performance tests, the stallions are judged on conformation, movement, rideability, free jumping, and performance. Only two inspection sites license AHS stallions -- one each in Maryland and California. To pass the Hanoverian stallion inspection, a stallion must receive an overall score of 7 with no subscore lower than 5. If a stallion passes, he is considered “provisionally licensed” and is limited to the registration of only 20 AHS foals per year. Within two years the stallion must then complete a 100 day performance test at an approved facility. The atmosphere is festive, the people are friendly, and the inspectors invite questions from anyone. I went with a friend Pam who thought she saw a problem with a mare's correctness of movement, and later the inspector also pointed it out. The inspector and discussed the malformation of the pastern that caused the crookedness, but it was hard to understand. My friend Pam approached the inspector later for more detail, and she came away enlightened. This is what makes these inspections so useful. Consider going to one in your area! Thanks for explaining all this. My 25-year old Hannoverian mare has the German brand and when I got her a few years back, she came with a portfolio just stuffed with certificates of inspection, Main Mare Book, etc. The wonderful thing about her is that even at 25, with her one eye, arthritic knees, and general age issues, when she moves under saddle OR purposefully in the pasture, she suddenly loses about 15 years. She lifts her back and engages, and you see just how fancy she really is. OT - I'm new to blogging, but I left you a brilliant award. I'm sure you've already won gobs of awards. :) I'm really enjoying reading your blog. It makes me sad that the mare was ridden quite behind the bit for the entire test. :( But, she was pretty. Thank you so much for this post!! I have been searching everywhere for information on inspections and this is the first bit of useful info I've been able to find. Any other sites that you think would be particularly useful? Behind the bit? Jeeze, I was asleep. Behind the *VERTICAL. Need information about gold and silver premiums!! Cant find it anywhere.